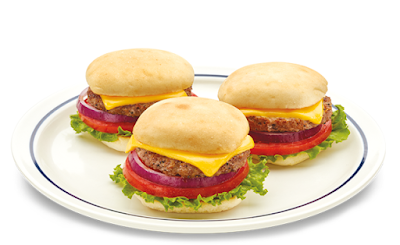 IHOP adds a number of new items on the menu including a Cheeseburger Omelette and Cheeseburger Sliders. - Cheeseburger Omelette - An omelette filled with grilled and diced USDA Choice ground beef, hash browns, tomatoes, onions, and American cheese, and topped with ketchup, mustard, and pickles. - Slider Trio - Three USDA Choice beef sliders with American cheese, lettuce, tomato, and onion. You can also get them as an entree which also includes a choice of either French fries, onion rings, hash browns, and seasonal mixed fruit. - Patty Melt - A grilled beef patty with American cheese and onions layered on marble rye. You also get a choice of either French fries, onion rings, hash browns, and seasonal mixed fruit. Kids get a few new choices including Chicken Nuggets (made with chicken breast meat and whole grains), French Toast with Nutella, Jr. Cupcake Pancakes, and a Jr. Cheeseburger Slider. Returning to the menu, you'll find Cupcake Pancakes, which are buttermilk pancakes made with rainbow sprinkles in the batter and then topped with cupcake icing, more rainbow sprinkles and whipped topping.